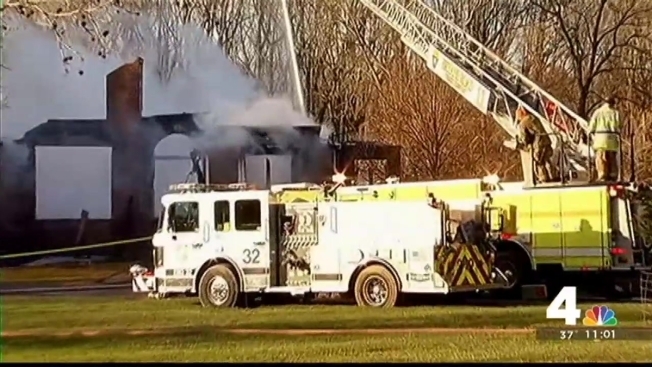 A massive fire destroyed a home in Prince George's County Monday morning. Fire crews were called to the 13400 block of Jamies Way in Accokeek just after 7 a.m. Flames and smoke could be seen coming from the home as Chopper 4 hovered over the scene. Homeowner Barrett Johnson said he saw flames coming from the back of the house and the basement when he woke up. "The only thing I could do was just get out," Johnson said. The home is located in a remote area with no fire hydrants in the area. Water tankers were brought to the scene to help fire fighters extinguish the massive blaze. Shortly after Prince George's County Fire and EMS arrived, the first floor collapsed, but no firefighters were inside at the time. Despite losing almost everything, Johnson remains in good spirits. "Everything that was lost can be replaced," Johnson said. The 4,200-square-foot home was equipped with smoke alarms and a sprinkler system, but the volume of the fire appeared to be enough to overwhelm the sprinklers, according to the fire department. The damage is estimated at $1.5 million. The two adults who lived there will make their own living arrangements.